Fans today have become an integral part of cooling any high-end system. With the most important fan in the box being the one on top of the heat sink. 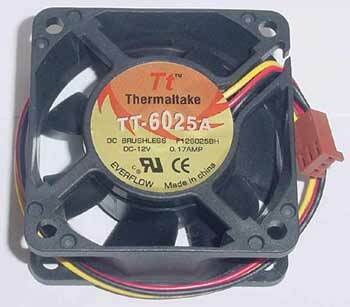 Today the top performer for CPU fans is the delta 60mm unit. This badboy puts out 36 to 38 cfm of cooling power, at an ear piercing 47 dBA. 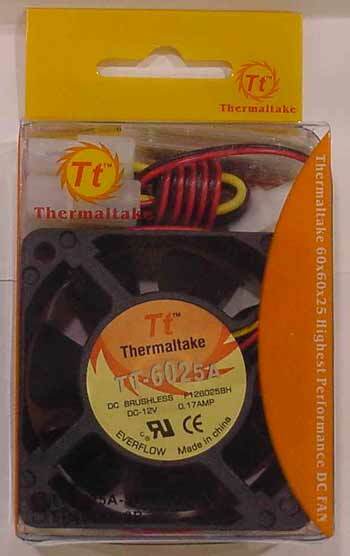 Recently Thermaltake put out a new 60mm kit that has specs that are kinda hard to believe! 31 cfm at a mere 28 dBA, putting it really close to a loud whisper. Impressive numbers, but can the real fan hold up to these claims? When I received the fan I was happily surprised by the simple package. It consisted of a clear plastic box, which held the fan and its accompanying extras, a 3 to 4 pin adapter and a set of long screws to use in case you need them. Installation will vary for some of you. My heatsinks are all designed to use 60x60x25mm fans, or are easy to throw one on; some heatsinks are less friendly to it. So, for me installation of the fan was simply unscrewing the fan and screwing in the new one, pretty much brainless work. Now onto how this lil guy works. I figured the easiest way to test this would be to throw it against 2 other well known and popular fans out there. So I did. Going strictly by numbers, the Thermaltake unit is pretty much in the middle for airflow, while coming really close to the YS Tech for RPM, and beating both units in the power use and noise category. This puts it in a VERY comfortable spot for running. Run some tests on the computer, getting both idle temps and Load temps. Removing and reapplying the heat sink after each test, and reapplying the Arctic Silver.